What are the Roth IRA age rules? Are you eligible to make a Roth IRA contribution? What about your children or grandchildren? 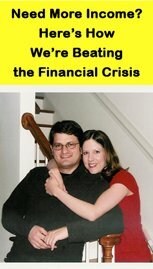 These are legitimate questions, and it's important for you to have a firm grasp of the Roth IRA rules before you open your account - that way you don't have to worry about eligibility issues surfacing years down the road, or worse yet, the unexpected arrival of IRS taxes and penalties. Is there a minimum age for making contributions? Is there a maximum age for making contributions? Is there a minimum distribution age? Is there a required distribution age? Know that the rules for your 401k and your Traditional IRA are quite different, so let's tackle each question one-by-one. Do the Roth IRA age rules require you to reach a certain age before you can make a contribution? The only requirement for making a Roth IRA contribution is earned income. Under the Roth IRA age rules, if you have taxable earned income from wages, you can make a contribution - regardless of age. (Read the Roth IRA eligibility rules to find out what constitutes earned income and what does not). To illustrate this concept, let's take an extreme example. Let's say your soon-to-be born baby, Cornelius Vanderbilt VII, is the focus of a new TV reality show. Following his birth, baby Cornelius gets all the essentials - a birth certificate, U.S. citizenship, and a Social Security number. If baby Cornelius generates income as a direct result of the reality show (meaning he has taxable income and files an income tax return), then baby Cornelius can make a contribution to a Roth IRA. While this would be a rare example of a baby making a Roth IRA contribution, it proves the point that age is of no consequence when it comes to Roth IRA contributions. It's earned income that matters. For good measure, let's look at one more theoretical scenario. Let's say you're 15 years old, and you cut your neighbor's grass once a week each summer for $25. Can you contribute to a Roth IRA if this is your only form of income? But only if you file an income tax return and claim the money you earn. Because under the Roth IRA age rules, if you don't claim the money you receive as taxable income, and you have no other form of income, then you can NOT make a Roth IRA contribution. Do the Roth IRA age rules set a maximum age for making a contribution? Do you ever become so old you're ineligible to make a Roth IRA contribution? Simply put, the IRS has never set an arbitrary maximum age beyond which you're incapable of making a Roth IRA contribution. Being old doesn't disqualify you from making a Roth IRA contribution anymore than being young does. What matters is whether or not you generated earned income for the year in which you want to make a contribution. However, keep in mind that pension benefits, retirement savings, and social security benefits are NOT earned income. You need to have income directly generated as a result of your physical or mental labor for that tax year. For instance, let's say you're an 85 year old Colonel from Kentucky, and you come up with the idea of selling your fried chicken recipe to restaurants throughout the nation. Can you use the proceeds from your chicken sales to make a Roth IRA contribution? Because under the Roth IRA age rules, it doesn't matter how old you are, it matters whether or not you generate income. And if you generate taxable income from your fried chicken business, you're eligible to contribute to your Roth IRA. 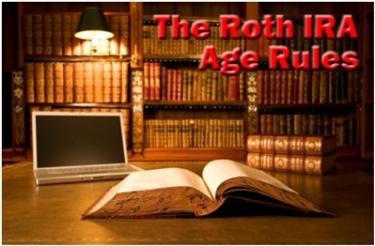 Do the Roth IRA age rules mandate a minimum distribution age? Yes, there is a minimum distribution age for withdrawing investment gains, rollover funds, or conversion funds from your Roth IRA. But if you're withdrawing Roth IRA principal, there is NOT a minimum distribution age. You can withdraw your original contributions at any age without penalty. For example, let's say you're 23 years old, and for the past two years, you've contributed the maximum amount of $5,000 to your Roth IRA. Your Roth IRA has a current total value of $12,500 - $10,000 in original after-tax contributions and $2,500 in investment gains. Under the rules, you can withdraw up to $10,000 tax-free and penalty-free. Because under the rules, you can withdraw your original principal contributions at any age, at any time, and for any reason without having to pay income taxes or an early withdrawal penalty. However, if you want to withdraw the $2,500 in investment gains tax-free and penalty-free, you need to wait until age 59 ½. Because that's the minimum distribution age established under the Roth IRA age rules. If you withdraw investment gain, rollover funds, or conversion funds from your Roth IRA prior to age 59 ½ and meeting the Roth IRA 5 year rule, then you potentially owe income taxes as well as a 10% early withdrawal penalty. For example, let's say you're 45 years old, you're in the 25% tax bracket, and you have $120,000 in your Roth IRA - $50,000 in original contributions and $70,000 in investment gains. You owe $24,500 in taxes and penalties. Because under the Roth IRA age rules, any withdrawal of investment gains prior to age 59 ½ is subject to income taxes and a 10% early withdrawal penalty. Since you can withdraw your original principal contributions tax-free and penalty-free at any time and for any reason, you're $50,000 in original contributions is tax and penalty-free. But the remaining $70,000 investment gain is subject to income taxes at your current rate ($70,000 * 25% = $17,500) and a 10% early withdrawal penalty ($70,000 * 10% = $7,000). Combined, your income tax liability ($17,500) and your early withdrawal penalty ($7,000) equal $24,500. Do the Roth IRA age rules force you to take distributions at a certain age? Unlike your 401k or Traditional IRA which force you take distributions at age 70 ½, you'll never be forced to draw down your Roth IRA simply because you've reached an arbitrary age. In fact, as we previously discussed, you can continue to make Roth IRA contributions well into your 70's, 80's, 90's, and beyond as long as you have taxable earned income. At first glance, this may not seem like such a big deal, but it is. After all, what's the purpose of putting money into a Roth IRA, a 401k, or a Traditional IRA? The purpose is to take advantage of tax-free compounding investment returns. But if you're forced to withdraw your money from your tax-free account, then it can't continue to grow tax-free! That's one of the major advantages of owning a Roth IRA vs. a 401k or a Traditional IRA. What if you don't need to tap into your retirement savings at age 70 ½? When it comes to your 401k or your Traditional IRA, you don't have a choice. You're forced to begin making annual withdrawals. But your Roth IRA? Under the Roth IRA age rules, you aren't forced to do anything. As a result, your account continues to grow tax-free, so you have more money down the road when you need it most. For example, let's say you're 70 years old, you're in the 25% tax bracket, and you have $75,000 in your Roth IRA. Because you can get by on your pension and social security benefits, you've never touched the funds in your retirement accounts. You figure you may need those funds if you ever end up in a nursing home or assisted living. As a result, you choose to let your Roth IRA continue to grow tax-free. An 8% annual return on your $75,000 nets you a tax-free $161,919.37 when you're 80 years old. But what if your money was in a Traditional IRA instead? Let's say you're forced to take out $75,000 at age 70 ½. You can get the same 8% annual return, but it's no longer tax-free. Since you're in the 25% tax bracket, you end up with only $121,439.53 when you're 80 years old. That's a difference of $40,479.84! While this is an extreme and oversimplified example, I hope the point is clear. The longer you can compound your money tax-free, the better! The Roth IRA age rules are straightforward and easy to understand. Age 59 ½ is really the only age you need to remember in regard to your Roth IRA. That's the age when (assuming you've met the provisions of the 5 year rule) you can withdraw your investment gains, rollover funds, or conversion funds tax-free and penalty-free. Remember, as long as you have taxable earned income, it doesn't matter how old you are. If you file a tax return, you can make a Roth IRA contribution.